Ensemble supports HL7 Version 2 messages as virtual documents. A virtual document is a kind of message that Ensemble parses only partially. This kind of message has the standard Ensemble message header and the standard message properties such as ID, Priority, and SessionId. The data in the message, however, is not available as message properties; instead it is stored directly in an internal-use global, for greater processing speed. The following figure illustrates the flow of an HL7 Version 2 message through an Ensemble production that works as an HL7 interface routing engine. It shows elements that are referenced by configuration items, but that are not themselves configuration items. These elements include routing rule sets, data transformations, virtual documents, and schema definitions. You create these items when you follow the instructions in this book. An HL7 business service receives an incoming message from the specific source application whose messages it is configured to accept. The business service passes the message to a specific HL7 routing process. 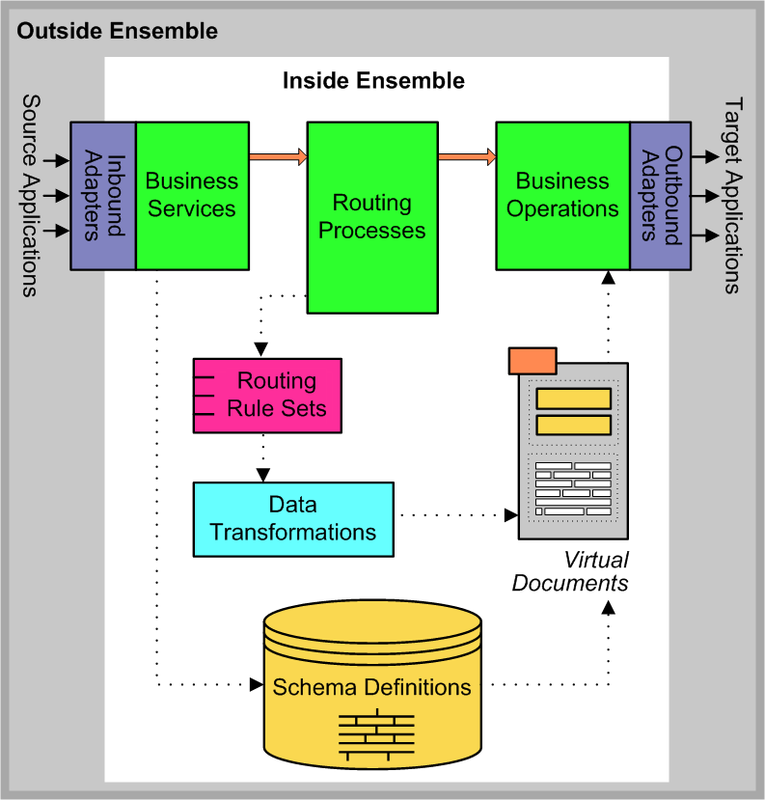 This is an Ensemble business process that prepares incoming messages from a HL7 business service for delivery outside Ensemble via a specific HL7 business operation. The routing process may validate the message against an expected HL7 schema definition. This may be a standard HL7 schema or a custom schema. (Not shown) If validation fails, the HL7 routing process passes the message to its configured bad message handler. This is an HL7 business operation that disposes of any incoming HL7 messages that fail validation, usually by saving the messages to a file. It may also enter an error in the Event Log or alert an operator. The HL7 routing process applies a routing rule set to the message. The routing rule set chooses one or more target business operations and applies any data transformations that may be needed to prepare the message for the target application. In the typical case, some data transformation is required to prepare the message for the target. The routing rule set may invoke transformations that are custom coded, but commonly transformations are created using the Ensemble Data Transformation Language (DTL). DTL can call out to utility functions or your own class methods for more complex calculations. When the outgoing message is ready, the routing process passes it to an HL7 business operation. The business operation provides the address and framing information required to send HL7 messages to the target application. (Not shown) By default, all HL7 messages that pass through the production are retained in the Ensemble message warehouse for as long as wanted. While in the message warehouse, the contents of HL7 messages are available for tracking and viewing using Management Portal features such as the HL7 Message Viewer, Message Browser, and Visual Trace, or by issuing an SQL query. You can configure the production to purge old messages automatically or at an administrator’s discretion.